After being out of town for 2 1/2 weeks for the holidays and not participating in Bountiful Baskets or Sunizona’s FarmBox, my house had no produce! Well, I take that back, I think my husband had gotten some bananas just before the kids and I got back. 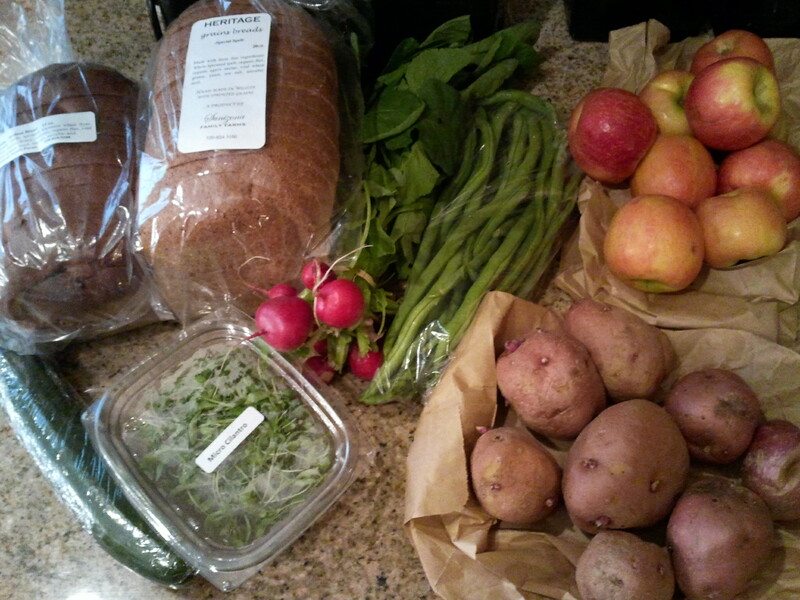 So, I was very excited to get my FarmBox last Wednesday and then Bountiful Baskets this past weekend. I picked a cucumber, micro cilantro, red potatoes #2 (non-perfect potatoes), raisin walnut bread, special spelt bread, radishes, green beans, and pink lady apples. All delicious! We really, really love the bread. 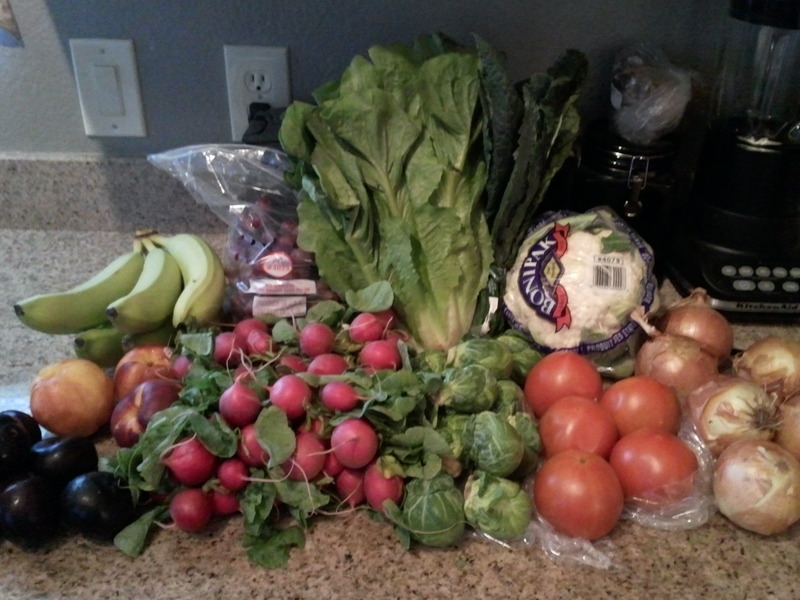 It was a good haul at Bountiful Baskets this week. 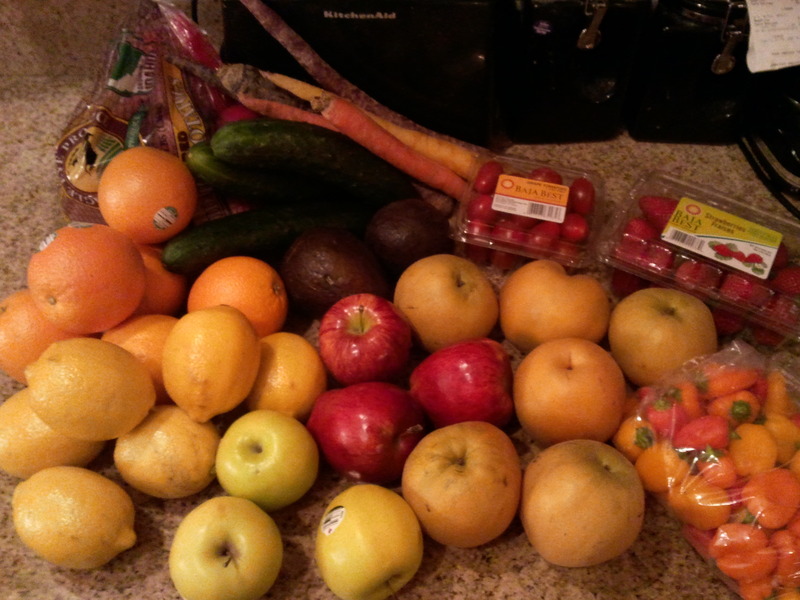 I got the conventional basket and the new juicing pack. 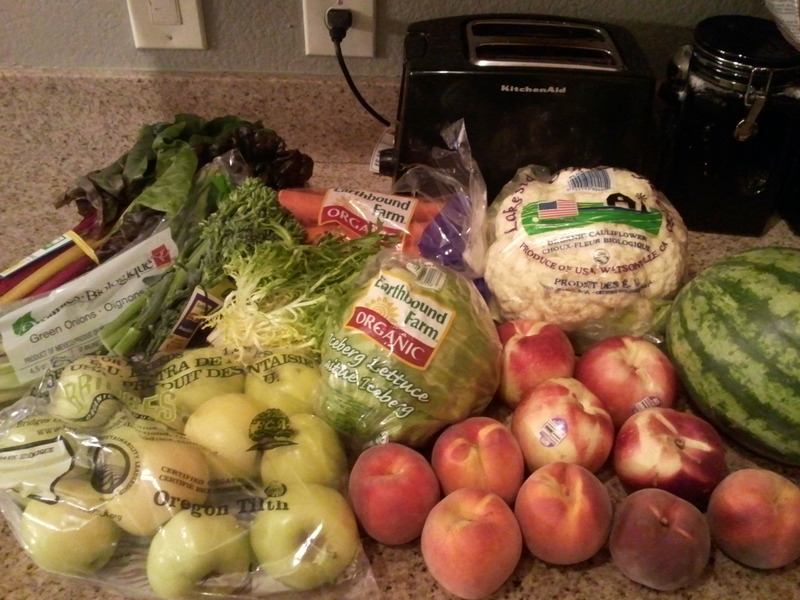 I have a juicer, but honestly, I got the pack more for the extra produce offered in it, it’s all things we love to eat. Red potatoes, cucumbers, rainbow carrots, avocados, grape tomatoes, sweet peppers, strawberries, oranges, lemons, red delicious apples, golden delicious apples, and Asian apple pears. I’ve already used the lemons to marinate chicken and potatoes for mashed potatoes. We’ve been snacking on the peppers, cucumbers, carrots, and apples. I also made guacamole with the avocados. 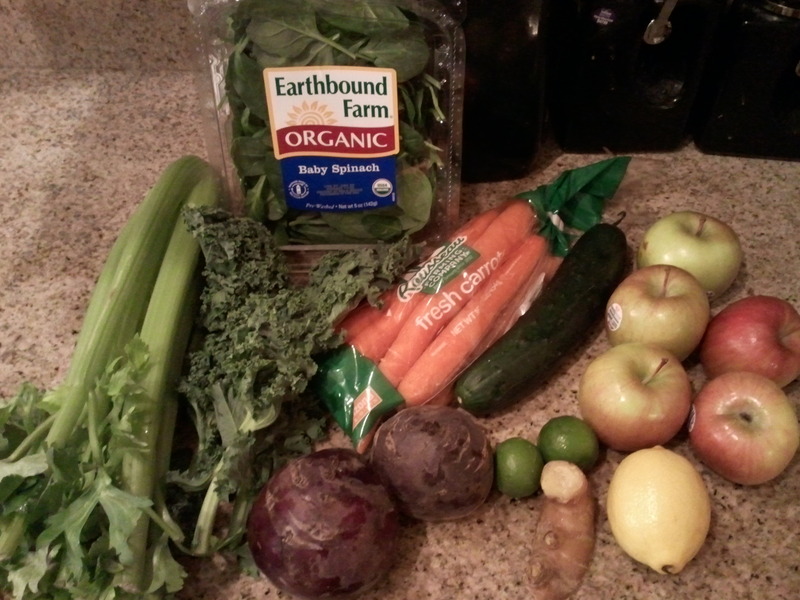 This is the new juicing pack. Great mix of fruits and vegetables, celery, kale, baby spinach, carrots, beets, cucumber, limes, ginger, fuji apples, and a lemon. I may juice some of this, but more likely we’ll just eat it. 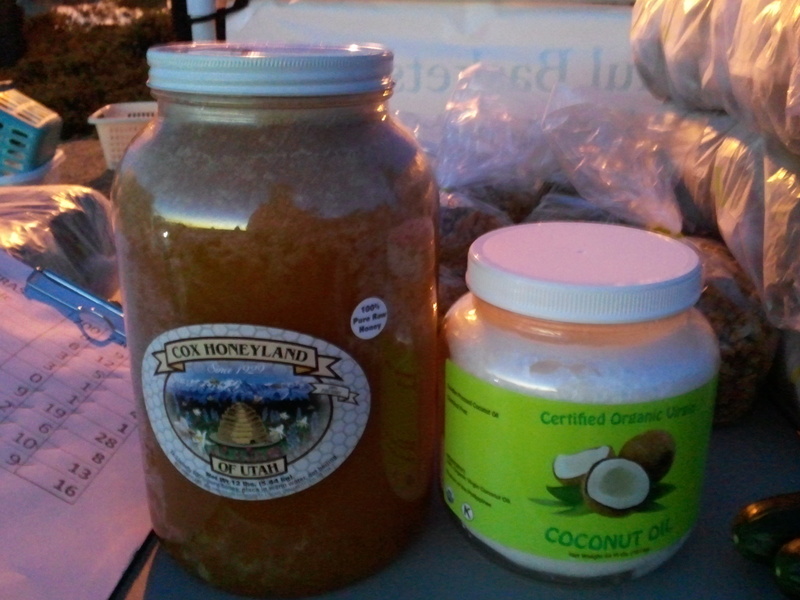 Finally, I didn’t contribute for these, but snapped a picture of the 12 lb jar of honey and the 1/2 gallon of coconut oil, just to show what they look like. I haven’t done this in a while! I actually have a basket picture! This week, I got the conventional basket, the Mexican themed veggie pack, and the cherry pecan granola. We got Romaine lettuce, papaya, broccoli, Roma tomatoes, watermelon, rainbow carrots, Hachiya persimmons, fuji apples, mushrooms, cantaloupe, and bananas. I’ve already peeled and pureed the persimmons, and will be making Persimmon-Cranberry cookies. Still working on what to do with the papaya. The Mexican themed veggie pack had tomatillos, dried chipotle peppers, yellow onion, garlic, Mexican grey squash, key limes, avocados, and jalapenos. This week, I contributed for the conventional basket ($15), the Lunch Box fruit pack ($10.50), and the assorted bread pack ($10.00). I got Bartlett pears, bananas, peaches, green plums, leeks, broccoli, strawberries, tomatoes, corn, Romaine lettuce, and gold potatoes. I already used the potatoes and leeks in a delicious Potato Leek Soup (recipe coming soon!). I’m still working on a dessert to make with the rhubarb I got from my Sunizona FarmBox, so I will probably use the strawberries for that. 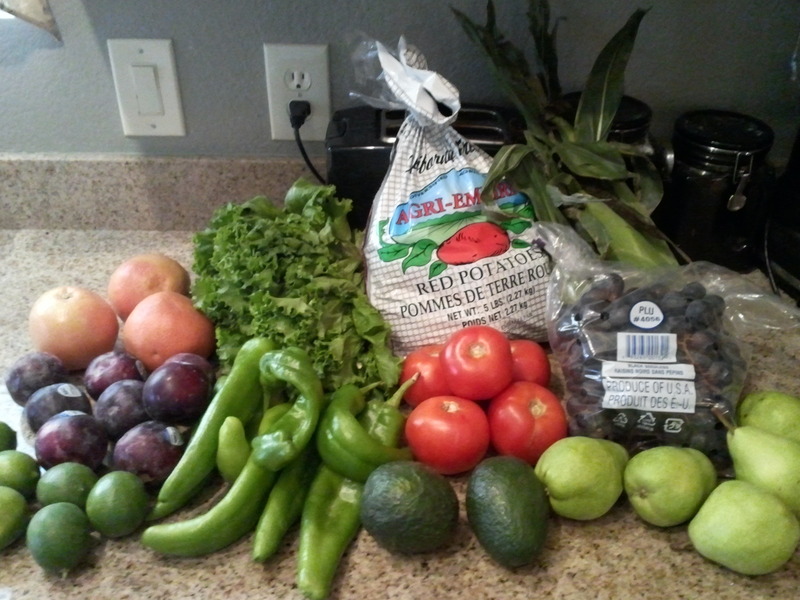 I may use the corn and tomatoes to make Roasted Corn Salsa. 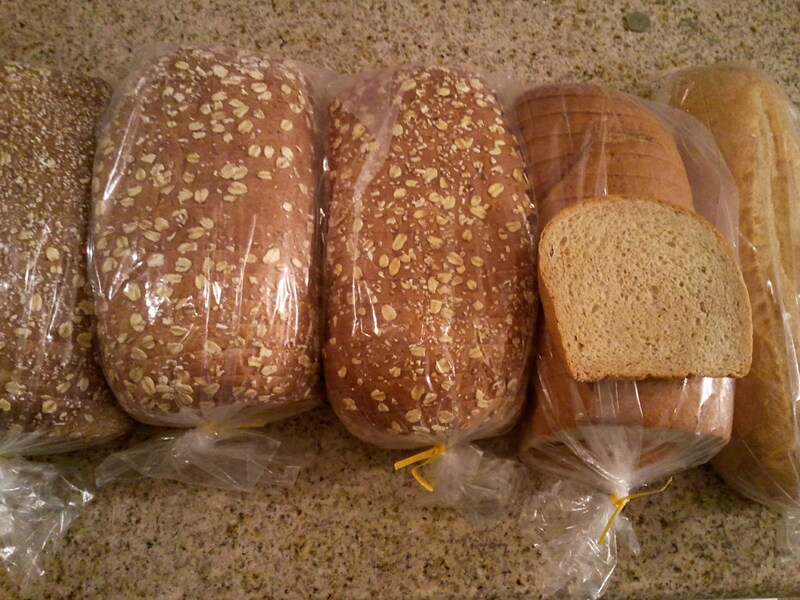 This pack had 4 loaves of Savory 9 grain bread, 1 loaf of dill and herb bread, and 1 baguette. I really like this savory 9 grain bread, I thought it was a little dry at first, but it’s been better and I like it more than the sweet 9 grain bread. The Dill and Herd bread is interesting, you can really smell the dill, but I’m not sure that it tastes a lot like dill. To me, it’s almost like a rye bread. Very tasty! And, I’ll be making some yummy toasted sandwiches for lunch with the baguette. 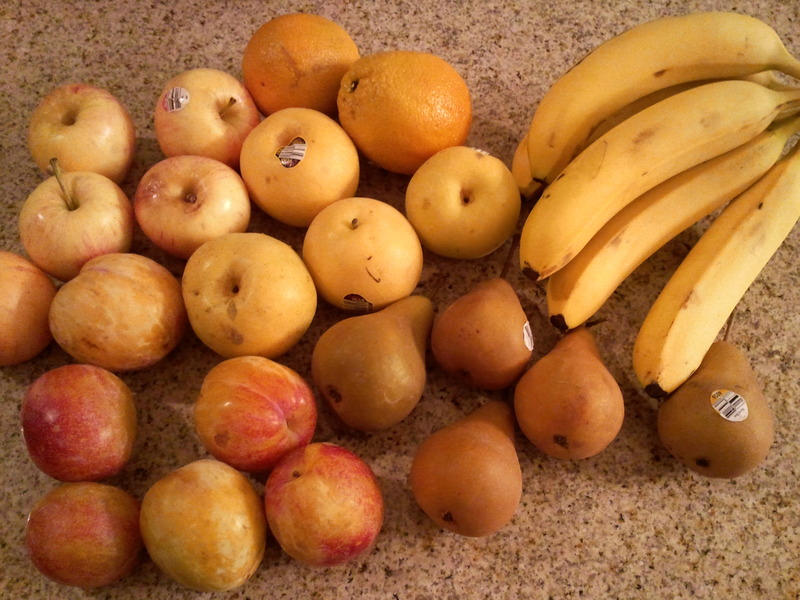 It included Gala apples, plums, oranges, apple pears, Bosc pears, and bananas. Yum! My daughter has loved taking fruit in her lunch each day, and this is perfect for that! I just realized I never got this post done! 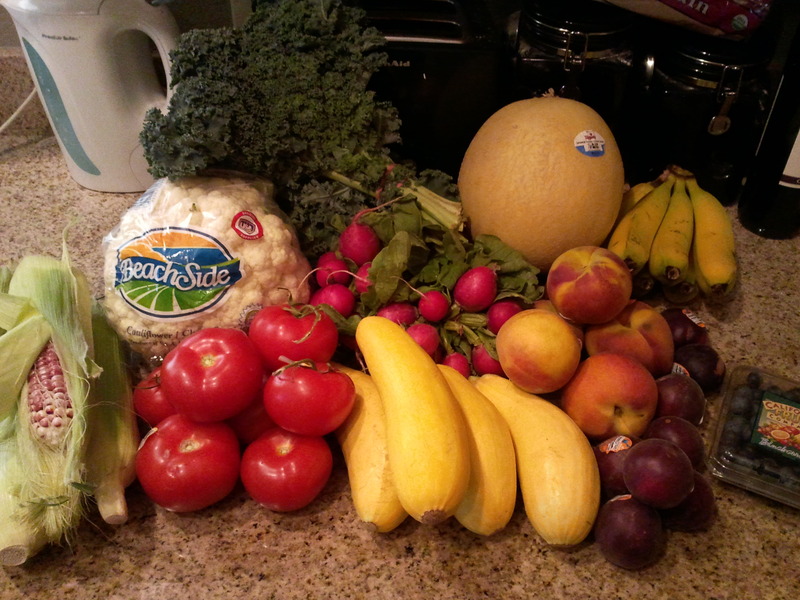 This week, I got the organic basket, a change up from the conventional. The conventional this week looked great too, it had cauliflower, Hatch green chiles, tomatoes, onions, Brussels sprouts, Romaine lettuce, apple pears, nectarines, cherries, champagne grapes, and grapefruit. Rainbow chard, green onions, broccolette, curly endive (frisee), apples, carrots, iceberg lettuce, peaches, white peaches, cauliflower, and watermelon. Great quality and quantity! I finally made it back to my regular A week site. It’s just been a busy few weeks and since I have to be at my site on B weeks, A weeks are my week to catch up on other things in life. 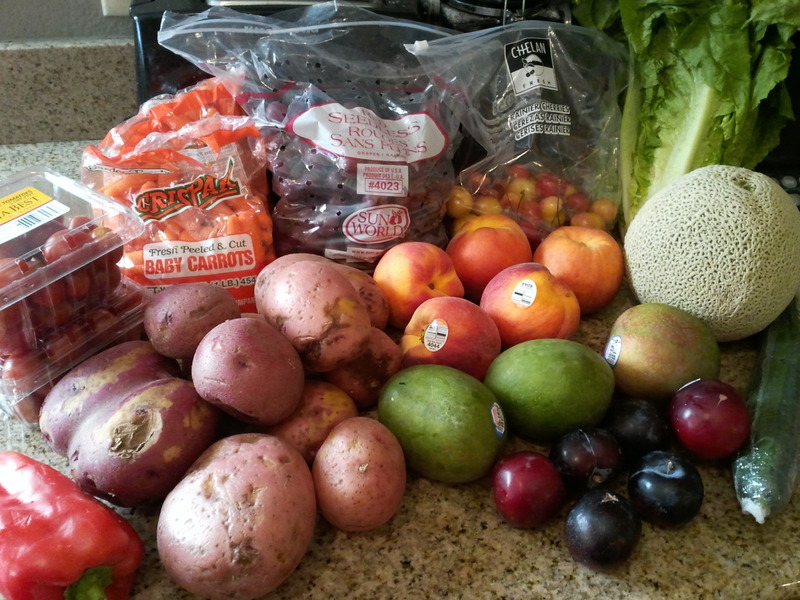 This week, I contributed for a conventional basket, the guacamole veggie pack, and the assorted bread pack. This week, we got bananas, nectarines, plums, grapes, radishes, Romaine lettuce, Brussels sprouts, cauliflower, tomatoes, and onions. My husband and kids were very excited about the radishes. I also brought home a few friends radishes, so we are set on them for the week! I will make some Radish Dip, and may try roasting them to see how they turn out. I will be making either salsa or tomato sauce with the tomatoes, just have to decide which. Not sure on the Brussels sprouts, either shredded or roasted, though. Next, the guacamole veggie pack. 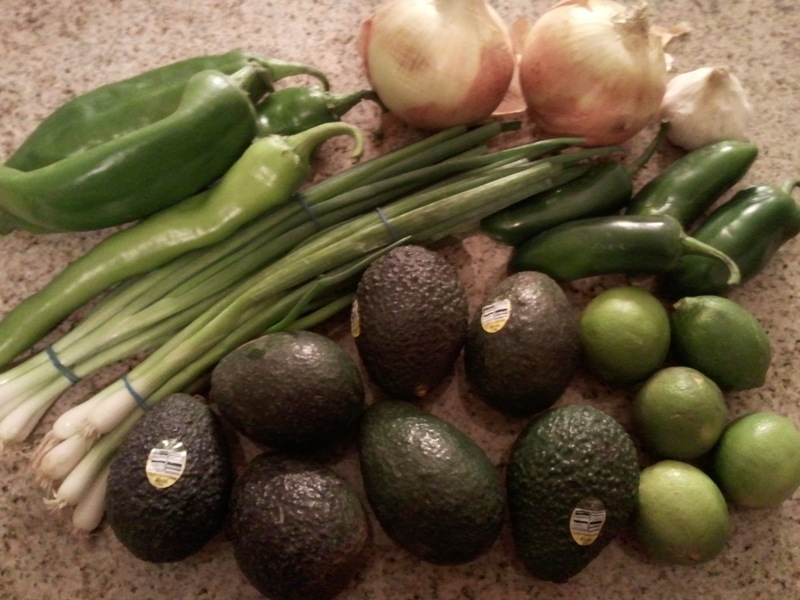 It contained Anaheim green chiles, yellow onions, garlic, green onions, jalapenos, avocados, and limes. My cilantro didn’t make it in the picture, but that was in here too. 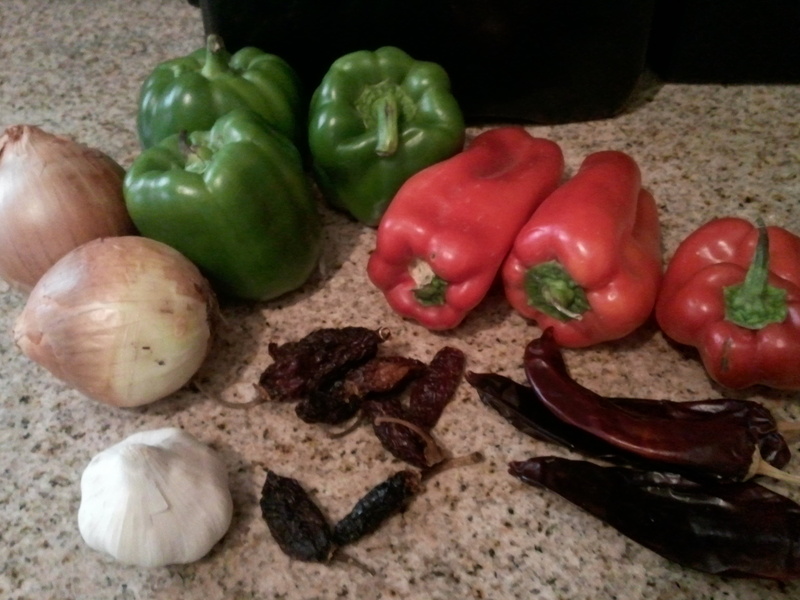 So, of course, I will make Guacamole, but I may make jalapeno poppers, and roast and dice the chiles for later, since I don’t like my guacamole too spicy. 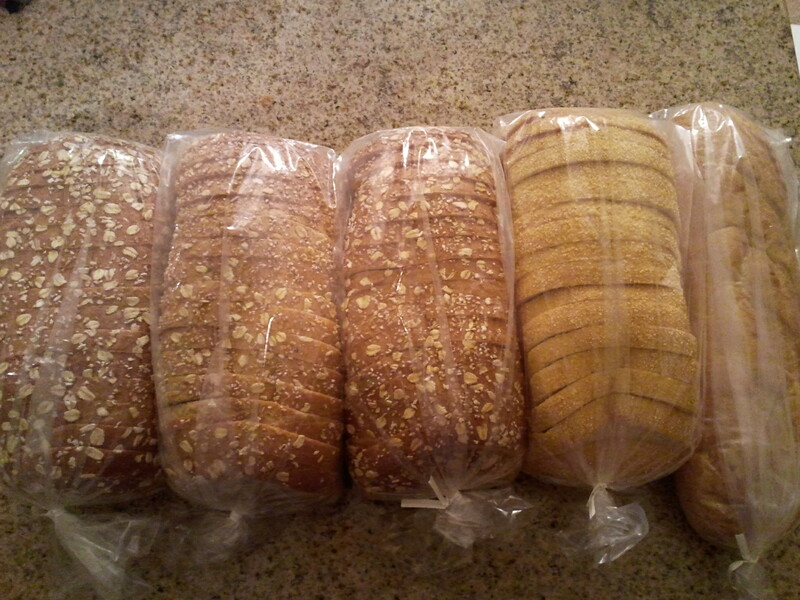 Finally, here is the assorted bread pack. It had 3 loaves of Savory 9 Grain bread (different from the regular 9 grain Bountiful Baskets offers), 1 loaf of English muffin bread, and 1 baguette. I haven’t tried the baguette yet, but the other 2 breads are very good. We’ve been toasting the English muffin bread and spreading homemade strawberry jelly on it for breakfast in the morning. This week I got the conventional basket for $15. The basket contained cherries, mangoes, peaches, carrots, Galia melon, celery, mushrooms, green peppers, tomatoes, green leaf lettuce, and Tuscan kale. With all the lentils and beans I have, I may try out some new soups this week, possibly a Sausage, Lentil, and Kale soup and maybe a kale and bean soup. 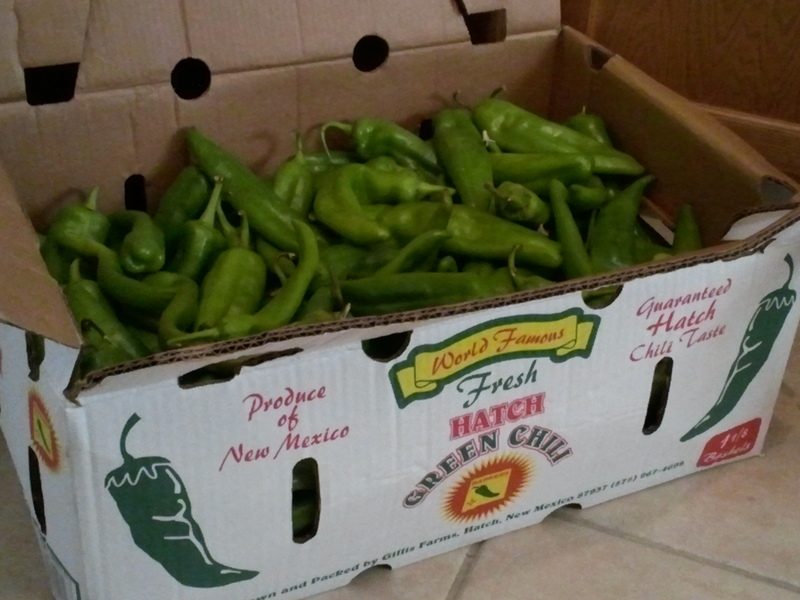 For the green peppers, I’m thinking about grilling them with some onions and steak for fajitas. The tomatoes will be sliced to for sandwiches, BLTs and grilled cheese, yum! Not sure on the mushrooms yet, but maybe I will make a stew with the mushrooms, carrots, and some beef. Chicken and noodles, using the celery and carrots sounds good too! I have been trying to get this written all week! We took an end of summer “staycation” to a resort in Tucson at the end of last week into the weekend, and then we had to get ready for our big start of school this week, part-time preschool and full day kindergarten for my two darlings. It’s been just a little busy here lately! 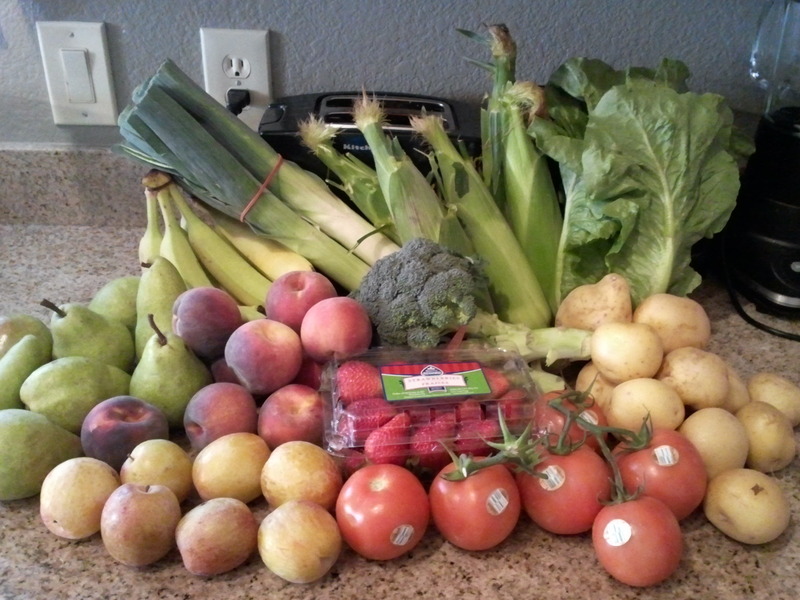 However, the wonderful thing about our “staycation”, was that there was a Sunizona Familiy Farms FarmBox pick up and a Bountiful Baskets site, each within 10 minutes from the resort. How awesome that both these programs are flexible enough that I can pick up in other locations so I don’t have to miss out on my produce! Friday afternoon was the pick up for my FarmBox. I got some of our favorites and tried a few new things this week. This week, I got 1 bunch carrots, 1 seedless cucumber (to make Refrigerator Pickles), 1 bag white potatoes, 1 Big Ol’ Beef tomato, 1 zucchini, 1 head garlic, 1 6 pack burger buns (these were amazing! 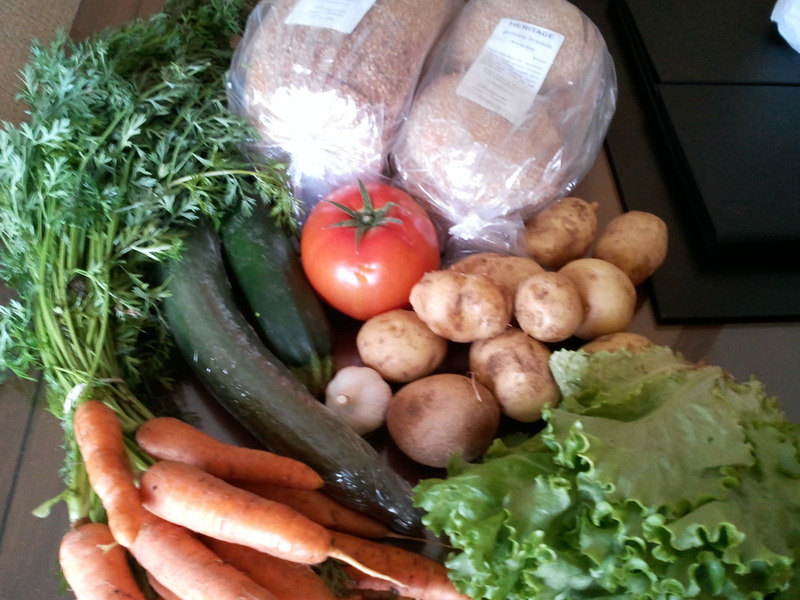 ), 1 Sprouted Khorasan Plus bread, and 1 head green leaf lettuce. This cost me $27.25. I love how fresh this all tastes! I am so excited that the FarmBox program is now delivering a little closer to me, and I’m still working toward bringing it to my city! 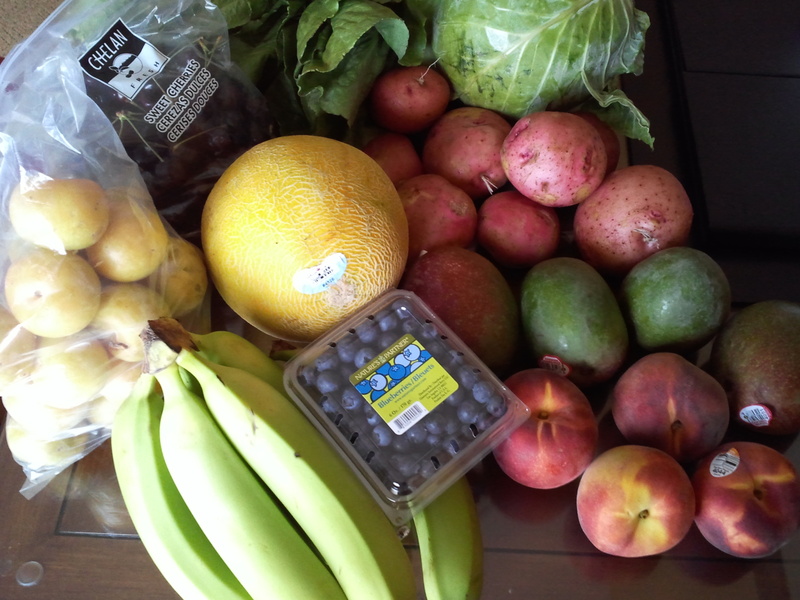 I got cherries, plums, a Galia melon, bananas, blueberries, Romaine lettuce, cabbage, red potatoes, mangoes, and peaches. Note: The type and amount of food may vary from another basket because of geographic location and because of variances in how case ends are distributed once everything is distributed evenly. I am very behind in posting! I have been very busy in the kitchen making new things, plus getting ready for school to start (1 more week until one starts Kindergarten and the other starts part-time pre-school, yikes! ), that I haven’t had much time to sit and type up everything. I’m hoping to get caught up here in the next few days, or at least maybe in the next week or so. 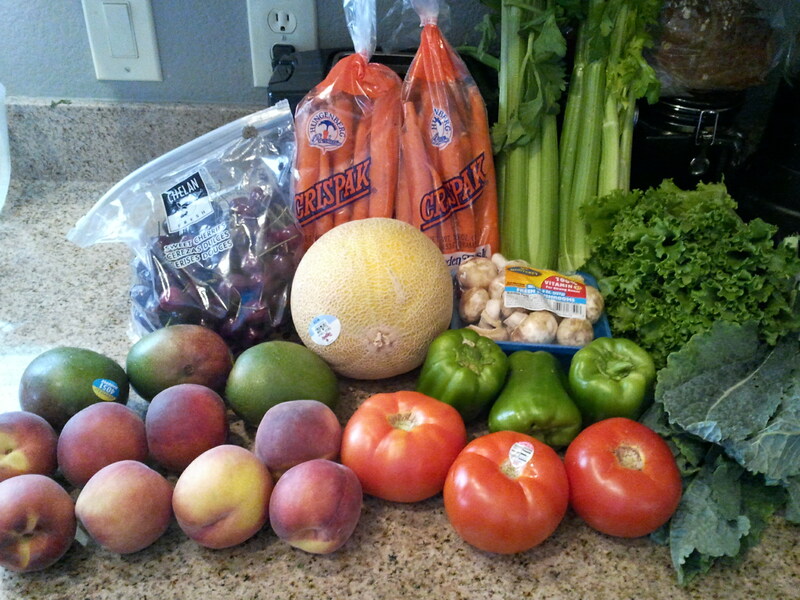 This was the conventional basket which had grape tomatoes, red bell peppers, red potatoes, baby carrots, red seedless grapes, peaches, mangoes, plums, Rainier cherries, Romaine lettuce, cantaloupe, and cucumber. The baby carrots and grapes are almost all gone. The red potatoes I will probably use to make mashed potatoes (with the skins) as a side for dinner one night. The cucumber has already been made into Refrigerator Pickles, which are half gone. Peaches, I may try to make peach fruit leather or will freeze. Mangoes will most likely go into a fruit smoothie. 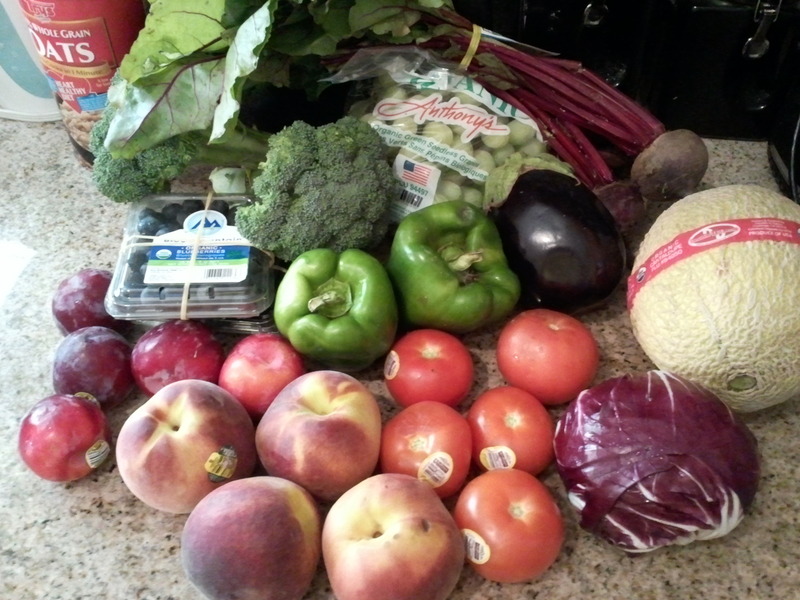 The organic basket contained broccoli, blueberries, plums, green seedless grapes, green bell peppers, peaches, beets, eggplant, tomatoes, cantaloupe, and radicchio. I tried to make a slaw with the radicchio and some cabbage and carrots I had, but the radicchio is just so bitter and overpowering that it doesn’t taste all that great. I think I will make Sesame Chicken again this week with the broccoli and some green pepper. 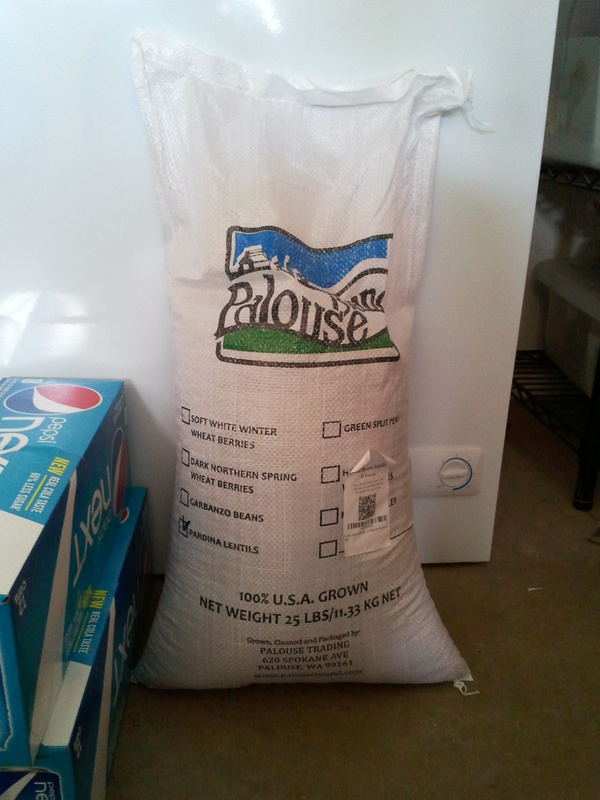 Finally, the 25 pound bag of brown lentils. What on earth can you do with all those lentils? Well, I love lentils in soup, especially Slow Cooker Spinach, Lentil, and Tortellini Soup. They also can be used in place of ground beef, such as in spaghetti sauce. I’m excited to get to explore more possibilities with the lentils! This week I went a little crazy with contributing! I got the conventional basket for $15, the Bountiful Baskets Granola for $15, the organic 9 grain bread for $12, and the 18 lb case of cherries for $24. We got red corn, cauliflower, tomatoes, kale, radishes, yellow squash, honeydew, peaches, bananas, black velvet apricots (also called pluots), and blueberries. The blueberries and radishes were gone within an hour of me being home. I had hoped to maybe make some Radish Dip, but my kids were happy eating all the radishes, so it’s ok. I may make Yellow Squash Casserole since I have a lot of it now. I will be making a cauliflower pizza crust again this week. Not sure about the red corn yet, but I’m sure I’ll come up with something. 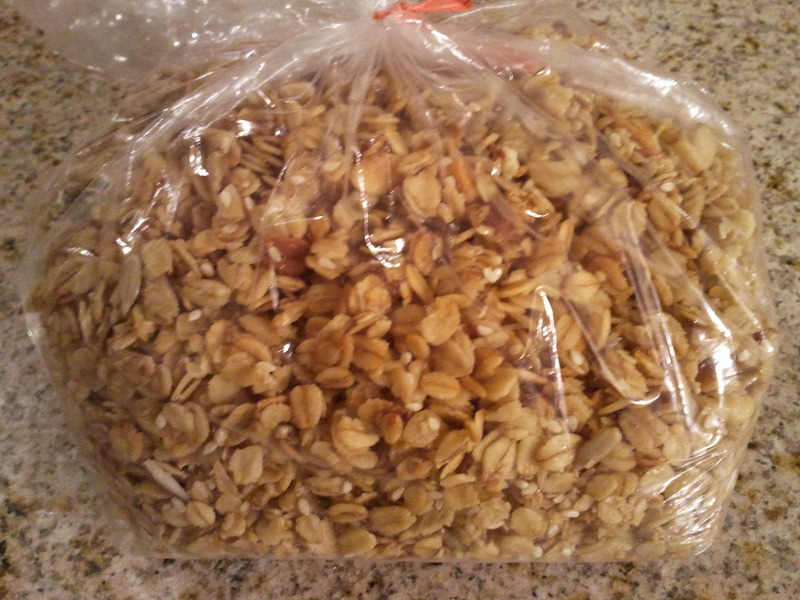 Here is how the granola looks. It’s just as yummy as it looks! This granola has oats, honey, canola oil, roasted & salted cashews, dates, diced pineapple, sunflower seeds, sesame seeds, sliced almonds, and almond & vanilla flavor. 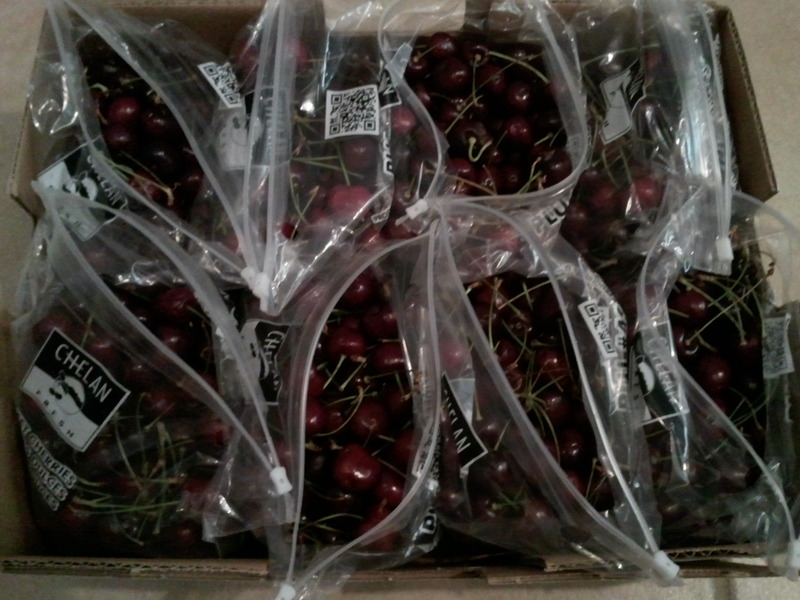 Finally, the case of Washington cherries. They are so good! I’ll be freezing most of them, probably make some desserts and maybe try out cherry limeade.